Business aviation operators defended a charge at the recent British Business and General Aviation Association (BBGA) annual general meeting that theirs was a lifestyle business writes Alison Chambers. “I won’t be lying to say that our industry is not a seductive business, but the truth of the matter is that when you get into it it is all consuming – growing a sustainable business that earns an income to support a certain lifestyle, but with crossroads and challenges all along the way,” said Marwan Khalek, CEO of Gama Aviation Plc. He had just been addressing a panel about consolidation, highlighting that in such a fragmented sector there are no dominant players. He said that in Europe no one operator holds more than a 4% market share and 85% of business jet operators fly less than five aircraft. With such slim margins and the high cost of operations, including the cost of conforming to mandatory regulations, more mergers and consolidation are inevitable, he and Patrick Margetson-Rushmore, CEO of London Executive Aviation (LEA) stated at the Selsdon Park, Croydon gathering. To put this into perspective, the most popular business aviation route in Europe: London Luton to Paris Le Bourget – supported 81 flights in 2014. Flights were made by a total of 24 different operators, each of them performing an average of just three flights a year by a mixture of light jets, VLJs and business turboprops. The average number of passengers on board – 2.4 people. LEA, while continuing with its own brand and management, is now part of the Lux Aviation Group of Luxembourg, which has just added Portugal’s MasterJet to a group which includes Abelag, Fairjets, and UniJet, with a combined 100-plus aircraft. Another significant courtship in this group is believed to be advancing, with Patrick suggesting that the Group’s goal is to grow to offer 500 managed aircraft. Talking from her own experience from the frontline of a merger (Gates and Partners recently came together with Kennedy's) Kennedy's Partner aviation lawyer Aoife O'Sullivan said: "You put on your best dress and there is romancing, but don't think you are dancing off into the sunset. Then come the financiers and the lawyers and it is not nice. It becomes extremely personal, as strategies are structinised and the business is pored over." Patrick suggested that too many companies in this highly competitive sector have an inflated opinion of what their business is worth. "It should be simple. What is the price you are prepared to pay, do our businesses complement each other - take it or leave it. Ours was relatively painless, but I appreciate Gama had the flotation going on." In January this year Farnborough Airport-based Gama Aviation ratified a merger with London Oxford Airport-based Hangar8 plc to become Gama Aviation plc. The new publicly listed company now supports 144 aircraft which are managed for owners, based in 15 countries including the USA, Africa and the Middle East. Gama has been in business for some 30 years, but it will be sad if new entrants can’t start in the way we did – that is healthy for the industry, but there has to be progression – start it to grow it and then consolidate, Marwan said. While the UK business aviation market is a fair way off peak year 2008 levels, it is leading Europe in flight movement growth. Significantly too, according to statistics from WINGX Advance, of the 340,000 passengers flown from the UK through business aviation in 2014; the estimated direct economic value creation of this traffic was €1.5bn. There were 7,155 unique tail numbers active in the UK in 2014, which means that about 25% of the global fleet touched in and out of the UK last year. 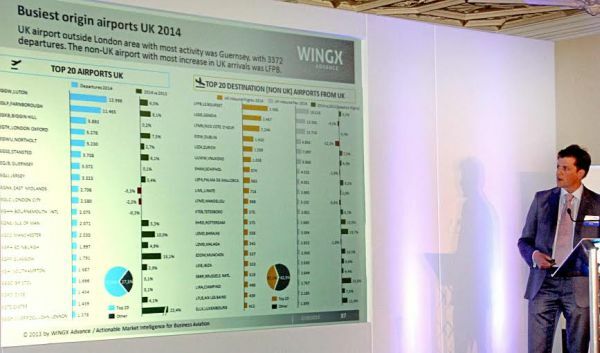 “That really highlights the centrality of the UK market,” WINGX Managing Director Richard Koe told delegates. The UK’s top ranked airports for business aviation in 2014 were: 1. London Luton – 13,998 departures. 2. Farnborough 11,465 departures. 3. London Biggin Hill 5,892. 4. London Oxford 5,278 and RAF Northolt 5,230. All these had positive growth, but London City Airport (which has mainstay scheduled traffic and premium landing fees because of its location) dropped to 10th in the league table. Its bizav movements were 2.2% down. Outside the UK Guernsey Airport was the busiest – with 3,372 departures handled by its FBO, Aiglle Flight Services. Top performers in the regions were Manchester, up 10% and Glasgow, up 15% for biz av activity. In the UK overall business aviation movements were up 3.4% in 2014 – equivalent to 280 extra flights a month, compared with 2013. “This was the most impressive growth of any European market and contrasted with the severe dip in activity in Ukraine and Russia,” said Richard Koe. Some 70,000 charter hours were flown by operators out of the UK last year, a 3.8% increase over last year, he added. It is good news that the UK is leading European growth in business aviation, BBGA acknowledges, but we still battle with this ongoing perception (by regulators, government agencies) that our community is all about providing luxury travel for a privileged few. “We have seen little recognition that our offering is corporate stimulation for inward investment to the UK and one that supports growing our exports of goods and services from the UK,” said BBGA CEO Marc Bailey. BBGA applauds the USA’s ‘No Plane No Gain’ campaign, launched and funded by the National Business Aviation Association, which focused on the corporate jet as a valued business tool. No other mode of transport can enable a time-poor executive to visit three or four European cities in one day and be home in time for dinner. “The fact is that 97% of our clients are flying for business. We are not about selling luxury; rather we are providing agile, time efficient services to optimise time in a business environment. The onboard facilities of the jets provided in most cases are no different from the majority of business class scheduled flights. Compared with the First Class offerings provided by Middle Eastern operators even our facilities could be viewed as quite ordinary, he insists.